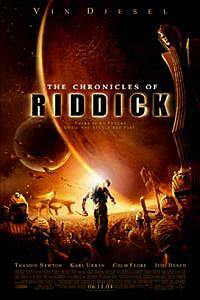 The Chronicles of Riddick (2004) - Sci-fi-central.com.  USA  2004  119m   Directed by: David Twohy.  Starring: Vin Diesel, Colm Feore, Thandie Newton, Judi Dench, Karl Urban, Alexa Davalos, Linus Roache, Yorick van Wageningen, Nick Chinlund, Keith David, Mark Gibbon, Roger Cross, Terry Chen.  Music by: Graeme Revell. Riddick has spent the last five years on the move among the forgotten worlds on the outskirts of the galaxy, eluding mercenaries bent on collecting the price on his head. Now, the fugitive finds himself on planet Helion, home to a progressive multicultural society that has been invaded by the Lord Marshal, a despot who targets humans for subjugation with his army of warriors known as Necromongers. Exiled to a subterranean prison where extremes of temperature range from arctic nights to volcanic days, Riddick encounters Kyra, the lone survivor from an earlier chapter in his life. His efforts to free himself and Kyra lead him to the Necromonger command ship, where he is pitted against the Lord Marshal in an apocalyptic battle with possibly the fate of all beings-'both living and dead-'hanging in the balance. TV Spot - Who Is This Man? If anyone cares to read the numerous articles relating to interviews surrounding the release of The Chronicles of Riddick, or later interviews with the director, David Twohy, or Vin Diesel, they will learn that Pitch Black and The Chronicles of Riddick are two separate movies; Pitch Black is the prequel to the Chronicles of Riddick which is planned as a trilogy - ie: Pitch Black is like what The Hobbit is to the Lord of the Rings Trilogy. Thus, the two movies are related to each other, but to a point: in essence, Pitch Black is designed to set up a basis for a world in which Riddick and the other characters can exist and make it plausible. The Chronicles of Riddick sets up a new adventure, and a new story for us to watch, subsequently ridding itself of links to Pitch Black with the early death of Imam, and later, Jack (now Kyra) and giving us something to look forward to in the future. Riddick's character stays true to his original intent - he is very much a loner, annoyed at being pursued by Mercs and kills without hesitation whenever his life is threatened. One must remember this is what makes Riddick the mass-murder he is - it's necessity. He still has the same diminished view of life in general as he had previously, voicing that the universe "had to end sometime", though will help other people if it benefits him or does not hinder him in anyway. Subsequently, he also maintains the same sense of grudging honour he had previously. His personality grows also, within this movie. Where in Pitch Black, he seems to have considered Imam and Jack as "survivors", he now seems to consider them "friends", the only ones he seems to have had in his life. This is referenced when he (Riddick) states he "showed trust" in Imam, by telling him where he would be hiding out after their escape from the planet in Pitch Black, and later, when confronting Lord Marshal, "You've killed everything I know". 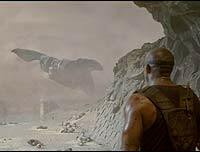 The lingo of this movie, also stays true to the initial story, however the backdrop now expands to an entire galaxy, just as the story of Riddick begins to expand, giving endless possibilities as to what will come next. Personally, I think that the fact the story is not limited to one planet and a few people who are picked off one by one is refreshing as it allows for the expansion of the story, more characters and more questions needing answers. Humanity itself takes on a darker side with the appearance of the Neromongers, whose religion considers humanity a mistake - who could actually blame them, particularly with their actions? Thus we learn that "evil" as society sees it can be present in many forms - what's the difference between the Lord Marshal and Riddick; they both kill people don't they? The answer? Lord Marshal is greedy and power hungry; Riddick kills to survive, and he's the one persecuted and hunted for it. Twisted! And yet, I find it strangely reminiscent of today's society, where politicians can get away with murder, whilst the common man doesn't have a chance in hell. Riddick himself stated to Johns in Pitch Black, when the latter suggesting killing someone to feed to the creatures, "kept calling it murder when I did it". It's sad when you realise that most people who have commented on Chronicles thus far simply got a headache when they were forced to think about this movie and decided "duh, my brain hurts lots". In my opinion the acting works for each and every character. Diesel is extremely believable as anti-hero Riddick; how many people can say that they could pull off being able to show concern - and later tears - for a moody, identity-confused, young woman, whilst at the same time being a seemingly emotionless, cold-blooded killer, who clearly has something troubling him under that cold stare? And Thandie Newton gives a limited, but nonetheless wonderful performance as Dame Vaako, a futuristic version of Shakespeare's Lady Macbeth; same with Karl Urban's portrayal of the loyal and troubled Necromonger solider, Vaako, who reluctantly agrees with his wife's plans for greatness. And Dame Judi Dench, admittedly, her time is brief, but nonetheless enticing as Aereon, the Elemental who teases Lord Marshal about his future and who is essentially the one makes us ponder, "What makes a Furyan so exceptional?" Now don't get me wrong, I am not someone who studies films in-depth in order to find a good side out of what others have deemed "Riddick-u-lous" (and whoever first wrote that one obviously had to think really hard about that pun didn't they?) In fact, I'm an fanatic when it comes to action movies, and I know what I like - and I like this. It has suspense, questions, explosions, fights - everything a fanatic like me could want. Maybe these critics should rent Catwoman and see what a real bomb is before suggesting to others that it is not even worth renting, let alone seeing a sequel to. When one watches this movie, you should not link it back to Pitch Black, merely acknowledge that Pitch Black is where our knowledge of Riddick's character began. Other than a few comments at the beginning of the movie and the appearances of Imam and Jack (Kyra), this movie has little relation to it's prequel, which is how it is supposed to be. The purpose of Chronicles is to serve as a backdrop to establish Riddick's history and perhaps personality growth that can be subsequently explored in future films. Perhaps the only link to Pitch Black (other than Riddick's character) that is left at the end is the question you ask yourself when the film ends, "What's going to happen next?" And I for one, would like to found out when the time comes. Review by miraitrunks766 from the Internet Movie Database.